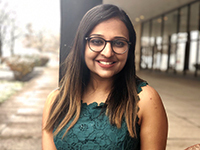 Trupti Dhumal, second year student in the Masters of Pharmacy Administration program, was selected by the International Society for Pharmacoeconomics and Outcomes Research (ISPOR) Student Travel Grant Selection Committee as a recipient of a 2019 ISPOR Student Travel Grant. The award includes complimentary registration to the annual meeting, registration to four short courses, and up to $1,300 in travel expenses. ISPOR 2019 will take place May 18-22 in New Orleans, LA. Award selection was based on an application submitted by each candidate and were scored on a 50-point scale evaluating a statement of intent, geographic location, the candidate's contribution to the ISPOR student network, abstract submission, and abstract acceptance. At the conference, Trupti will present two posters. The first is titled Patient satisfaction in substance use disorder treatment: a systematic literature review. This project is part of her Masters thesis working with The Salvation Army Harbor Light Center in Pittsburgh, PA. Her main supervisor on the project is faculty member Dr. Jordan Covvey. Other collaborators include Dr. Vincent Giannetti, Dr. Khalid Kamal, also faculty at Duquesne University, and Paul Freyder, Director at Harbor Light. The second poster is titled Shared decision making and use of decision aids in multiple sclerosis: a systematic review. Her supervisor on this project is Dr Khalid Kamal. "I am excited to present my work at the annual conference," Dhumal said. "This is an amazing opportunity and I am glad to be considered as one of the recipients for the award. I want to thank my research committee and the department for their constant support and encouragement. I am looking forward to representing Duquesne University and Graduate school of Pharmaceutical Sciences to the best of my capabilities."